The U.S.-Russia confrontation over Ukraine is getting increasingly personal at the highest levels. U.S. President Barack Obama has called on Russian President Vladimir Putin to “get serious about trying to resolve hostilities within Ukraine.” And Putin has criticized President Obama’s “aggressive” and “unprofessional” foreign policy. In the eyes of many people around the world, the leaders of Russia and the United States are the embodiment of all that is good or bad about their countries. And their public standing is a proxy for the image of their countries. 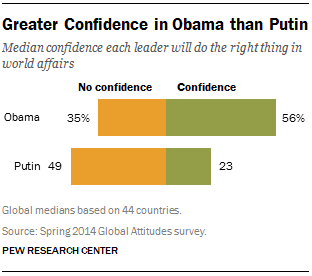 Most of the world has greater confidence in Obama than in Putin to do the right thing in world affairs by better than two-to-one (a median of 56% to 23%), according to a 44 nation poll by the Pew Research Center, conducted this year after the winter Olympics in Russia but before the recent conflict over responsibility for the downing of Malaysia Airlines Flight 17, which the U.S. has blamed on pro-Russian separatists supplied with weapons by the Russian military. An earlier 21 country survey in 2012 found a similar two-to-one margin of favorability for the U.S. president. In 2014, most Europeans were far more supportive of Obama than Putin. More than eight-in-ten French (83%) and seven-in-ten or more Italians (75%), British (74%) and Germans (71%) have confidence in Obama’s handling of foreign policy. Compared with last year, Obama’s image has dropped by double-digits in five nations – Brazil, Germany, Argentina, Russia and Japan. But it has risen appreciably in Israel and China. Putin has never been as well-known as Obama, nor generally as well liked. Majorities or pluralities in only six of the 44 countries surveyed say they have confidence in Putin to do the right thing in world affairs. Just 16% of Americans say they have a great deal or some confidence in the Russian leader. And the median confidence level in seven European Union nations is 18%. Only 20% of Japanese see his conduct of foreign policy favorably. And Putin’s recent conduct of international relations has undermined his reputation in the United States, where the positive opinion of Putin’s handling of world affairs has fallen 12 points, from 28% to 16%, since 2012. (The 2014 survey was largely conducted after Putin’s March 18 statement that Russia would annex Crimea.) In Poland Putin’s rating is also down 11 points, from 19% to 8%. Notably, however, while fewer than a quarter of people in Germany and the United Kingdom and less than a fifth in France have a positive view of Putin, their assessments have not slipped over the last two years, even in the wake of the invasion of Crimea. One place Putin does outshine Obama is in the assessment by the citizens of their respective countries. More than eight-in-ten Russians (83%) have confidence in Putin’s foreign policy, and that backing is up 14 points since 2012. Just 58% of Americans express confidence in Obama’s conduct of international relations, largely unchanged from 61% who held such views two years ago.